Learning how to self-defend is one of the most important skills that you can get in your life. The reason for this is simple – there are far too many dangerous situations that you may get into in life. The streets are far from safe. There are many malicious people that will try their best to take your money or harm you. And this is why it’s important to defend yourself at all times. If there is one self-defense skill that we recommend you learn, then it’s Muay Thai. Muay Thai is a martial art that comes from the country of Thailand. It has managed to climb the rankings of the martial arts and nowadays it’s one of the most popular martial arts in existence. This says something for Muay Thai – as there are dozens of different martial arts that span the entire world. Muay Thai is great for a stand-up fight. You will learn how to use your arms and legs to deal devastating damage to your opponents. Your hands, elbows, knees, and shins will be all utilized to this end. If you begin training Muay Thai, you will come to notice that your skills in self-defense are rising and getting better and better. Nobody would ever think of the fact that martial arts and self-defense can be fun. Well, as it turns out, they are very fun to learn – and this is especially the case when it comes to Muay Thai. You will find out that there are no two classes that are exactly the same. If you want to learn a dynamic set of skills and have fun while doing so – then our best recommendation is for you to find a Muay Thai training camp as soon as possible. And in the end, you will feel a lot safer than ever before – knowing that you have learned solid martial arts skills and that you’re able to protect yourself and your close ones. We hope that you will have fun with Muay Thai and that you will use it for doing good in the world. Many people have idealized martial arts as a way in which you can become a proficient fighter. But little do they know that there are also many other benefits of training martial arts in a camp. The first big benefit of training, say, Muay Thai, comes in the fact that you will be improving your health with each and every consecutive training session that you walk into. So, the best time to start the process of improving your health is right now. Go ahead and find a Muay Thai training camp as soon as you can. You will be delighted to learn that there are many of them all around the world since Muay Thai is one of the most popular martial arts in existence. We believe that there are thousands of training camps all around the world. So, what are some of the health benefits of training Muay Thai? The first thing that you can expect is that you will lose weight. If you have had any issues with having excessive weight in terms of body mass, then training Muay Thai is one of the smartest things that you can do with your spare time. You will have to expend a lot of energy during each and every training session that you have. If you can add in some healthy changes to your diet, then you will do all that’s in your power to improve your health. Moreover, by training Muay Thai you will be building up your muscle mass. This is not something to be taken lightly – strength is one of the most important parameters of health. If you wish to stay healthy – then it’s important for you to stay strong. But we can spend hours and hours in trying to drill in the importance and benefits of training Muay Thai and it will amount to very little if you fail to act out on this. So, your best bet is to find a Muay Thai training camp and start training Muay Thai as soon as possible. This will make you healthier and stronger. Are you tired of the boring gym training session in your neighborhood? Do you want to feel adrenaline rush and good sweating? If these things bother you – travel to Thailand and starting training Muay Thai! Recreational sports are getting saturated with the usual offers – aerobics, gym training sessions with the same old programs. People who are training for recreation are looking for new ways for physical activity, something that is more effective and more complete at the same time. We are talking about both genders of course. In the recent years men and women have found that various martial art disciplines and their variations like kick boxing, Muay Thai (Thai Boxing) and aero kick boxing actually work. We will focus on Muay Thai because we consider it to be the best among all others. There are many people who think that Muay Thai is actually an exhausting and hard fighting martial art in which the goal is to hurt your opponent as much as you can. But that’s not true. Muay Thai is an ancient martial art (according to some source it is 2.000 years old) and the only weapon that is used in this martial art are the limbs. Muay Thai training sessions are very good for those who want to sculpt their whole body and acquire a balance between their physical and mental abilities. What makes Muay Thai special is that it can be used by anyone. Older people find this combat sport as a great way to relieve stress and activate their muscles. The good sweating and fast calorie burning makes this sport attractive for women too. Just like any other training, Muay Thai training requires slow introduction into the training routine and with the help of the right trainers you can achieve that easily. When we talk about good trainers and Muay Thai in general there is no better place to start training other than joining a Muay Thai training camp in Thailand. With the help of the professional trainers you will achieve anything you want. 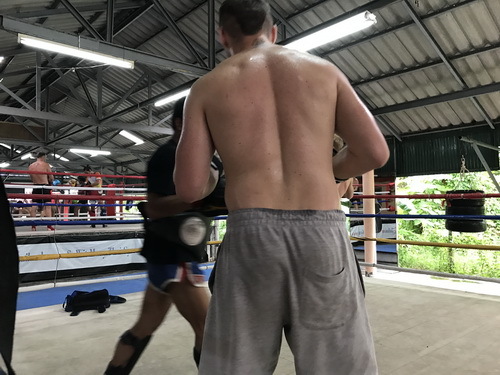 If you are looking for a professional and popular Muay Thai training camp in Thailand that has experience in working with foreigners we strongly suggest you visit Suwit Muay Thai training camp located on the unforgettable Phuket Island. Students in Suwit Muay Thai training camp are practicing original Thai way of Muay Thai training and with the help of the professional staff you will learn everything you need about Thai boxing and Thai culture and tradition in general. After all in order to fight like a Thai you must train like a Thai!